I had the pleasure of living in New York City some years ago and I learned a lot about the food culture while I was there. The pizza is awesome and we can’t argue with that, but one thing you don’t hear a lot about is their cheesecake. 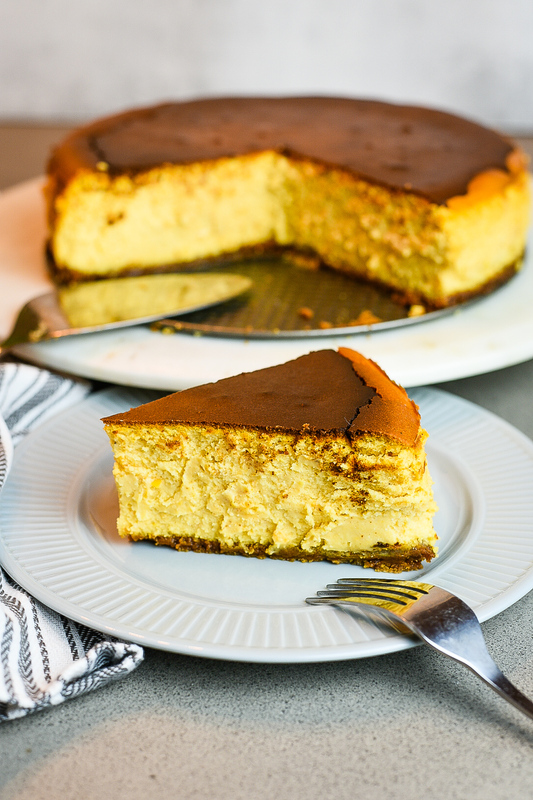 Unlike any no-bake version, the New York style cheesecake is rich and has a dense, smooth, and creamy consistency. 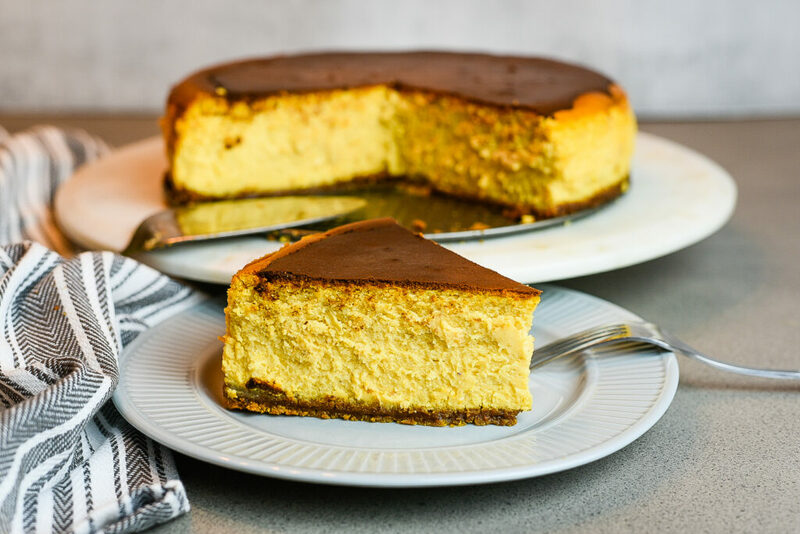 Making this style of cheesecake is no easy feat, but as they say, anything worth having is worth putting in the work for and with this cheesecake work will be required. Because the holidays are just around the corner, I wanted to come up with something where the sweet potato could shine. I really love sweet potatoes and I do my best to incorporate it into as many recipe ideas that I can. So today I bring to you a new creation called the Sweet Potato New York Style Cheesecake. The crust for cheesecakes are typically made with graham crackers so I decided to switch it up from the norm and go with Biscoff gourmet cookies instead. if you recall, I used these in a boozy milkshake I shared earlier this summer. This definitely added some great flavors to this already delicious dessert. I also used lemon zest and blended it with the sweet potato mixture. 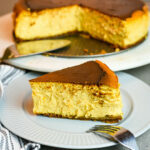 It brightens the cheesecake up a bit by enhancing and drawing out the sweet potato flavors. 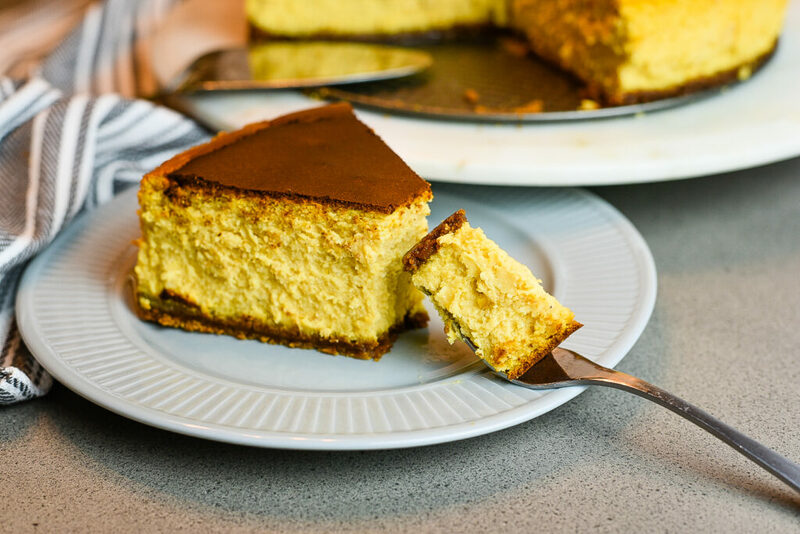 This cheesecake will definitely have you wondering where it has been your whole life :). 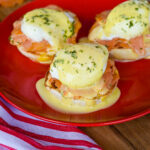 This recipe does have a few steps to it and you will need to have some patience while making it, but you will thoroughly enjoy the end result. 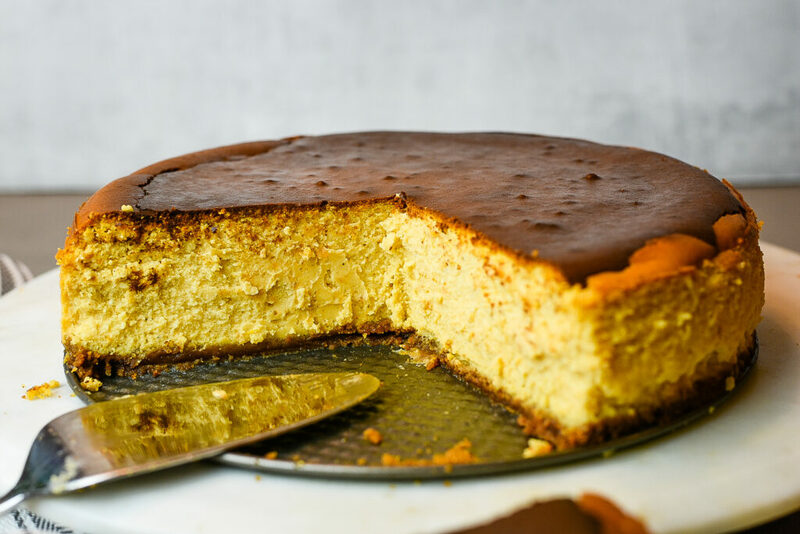 Give this Sweet Potato New York Style Cheesecake a try at the next family gathering and see how much your family will love you for it after. Enjoy! Begin making the crust by blending the Biscoff cookies then adding to a large bowl. Add sugar and melted butter to the bowl and stir until it begins to slightly bind. Add crust mixture to the bottom of a springform baking pan then spread evenly ensuring the crust is flat. Pre-heat oven to 375 degrees and bake crust for 10 minutes. Set to side when done. While the crust is baking, peel the sweet potatoes and chop into cubes then boil for 25 to 30 minutes. Strain and add to a large bowl. 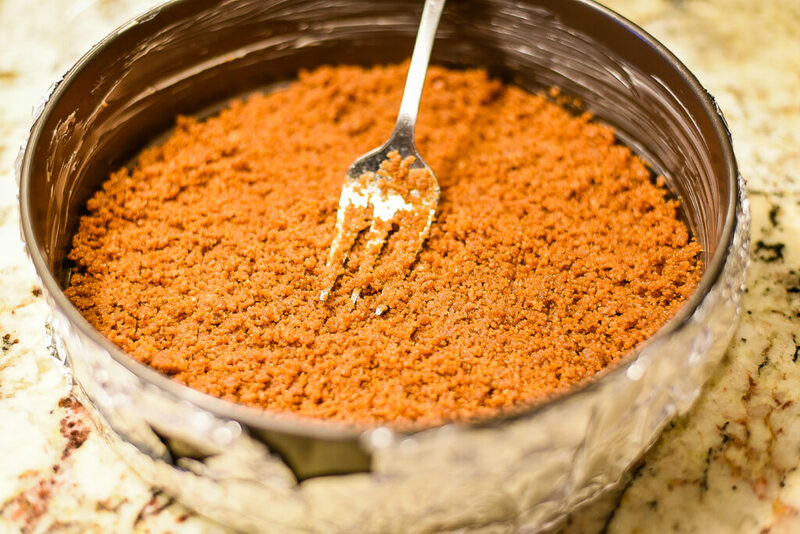 Add all sweet potato mixture ingredients into the bowl of sweet potatoes and mix well. For the cheesecake mixture, make sure the cream cheese is at room temperature then add to a large bowl. Add sugar to the cream cheese and begin to mix until smooth. Add the pastry flour, lemon juice, lemon zest, 2 cups of sweet potato mixture, and vanilla extract then mix well. Do not over blend. Add the eggs into the bowl one at a time slightly blending after each egg is added then add the Creme Fraiche. Blend until mixed well. Pour cream cheese mixture onto the crust and spread evenly. Cover the bottom exterior part of the baking pan with foil. Place pan into slightly larger baking pan. Add an inch of water into a third larger rectangular baking pan. This prevents the cheesecake from cracking while baking. 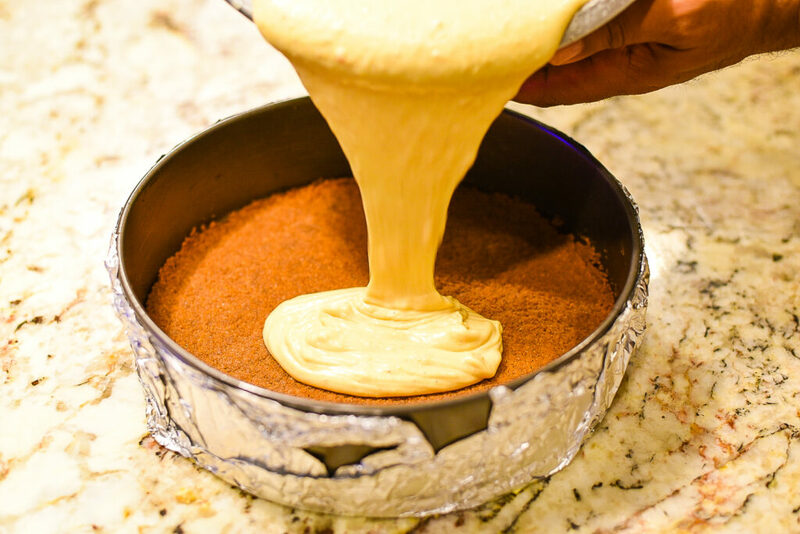 Adjust the oven temperature to 325 degrees and place cheesecake baking pans (with water on the bottom pan) into the oven for 1 hour and 45 minutes. Once the baking is complete, remove from oven and allow with to cool for 30. Remove from water and cool for 30 more minutes. Place in refrigerator for at least 8 hours. Serve cool. Haha! Now that’s a first! Well, I would be really surprised if he doesn’t enjoy this one. 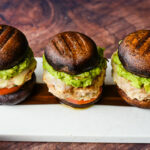 The sweet potato is not overpowering, but you’ll know it’s there. Let me know how it turns out! What’s the French yogurt cream cheese? Never seen it around Boston. Would regular cream cheese work or should I add some yogurt? Thanks. Hello Lili! So apparently I have France on the brain. I meant to type “Greek” yogurt cream cheese. However, yes, you can use regular cream cheese for this recipe as well. I only use the Greek variety as a lower calorie alternative. Let me know how it comes out!